(Claire Bernish) Documents recently dredged from the CIA’s massive database expose an effort by the former director to destroy documents evincing the agency’s illegal activities and operations. Preservation of records — the subject of acrimonious debate during the presidential election, thanks to Hillary Clinton’s use of a private server and disappearing documents — is pivotal to government transparency and accountability. And for preventing alterations and staving off lies. But edits scribbled on this draft indicate transparency in procedural record-keeping not only didn’t matter to the Central Intelligence Agency, it directly countered Director Bush’s and the agency’s interests. “Recommend deletion of bracketed paragraph,” “B” penned at the bottom — with brackets specifying the entire aforementioned sentence vowing to remain true to legal strictures. A strikingly divergent message emerges in the next draft. “A decision as to the disposition of those files concerning activities which the President’s Commission considered illegal and improper has not been finalized and the moritorium [sic] on destruction is still in effect. Bush signed it — but the fact the agency at his behest considered protectionism for itself in writing cannot be discounted. It could be definitively argued that conspicuous detail marked a brief moment of naked honesty for the CIA — as if the truth of what happens to records of nastier operations momentarily spilled onto the page. It isn’t as if the CIA — whether headed by Bush or another — never guiltily concealed its wrongdoing. “[T]he CIA inspector general’s office recently admitted to ‘mistakenly’ destroying their only copy of the classified report. Although CIA Director John Brennan possesses another copy of the torture report, he refuses to send a replacement to the internal watchdog’s office. Award-winning investigative journalist and current editor of Consortiumnews, Robert Parry, penned an article in 2000 concerning a 1976 car bombing in Washington, D.C.’s highbrow Embassy Row — about which the agency created a fake report to throw off the feds and further its own agenda. “In early fall of 1976,” Parry wrote, “after a Chilean government assassin had killed a Chilean dissident and an American woman with a car bomb in Washington, D.C., George H.W. 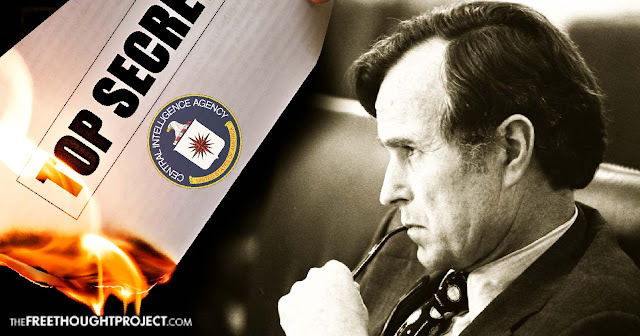 Bush’s CIA leaked a false report clearing Chile’s military dictatorship and pointing the FBI in the wrong direction. “The bogus CIA assessment, spread through Newsweek magazine and other U.S. media outlets, was planted despite CIA’s now admitted awareness at the time that Chile was participating in Operation Condor, a cross-border campaign targeting political dissidents, and the CIA’s own suspicions that the Chilean junta was behind the terrorist bombing in Washington. Parry’s in-depth investigation skips too far from the topic-at-hand to recount here, but those opening paragraphs sufficiently summarize the agency’s attitude toward covering up illegal and worse activities — not to mention how it attests Bush’s character and ethics. It seems reasonable for certain government agencies to maintain a degree of secrecy with information sensitive to national security — however, citing national security has written the permission slip for innumerable State wrongs and inexcusable encroachment on individual freedoms and liberties. And this from a CIA led by a man who would eventually reside in the White House — overseeing theoretically the clandestine activities of the entire body of Intelligence and other agencies under the control of the U.S. government. Perhaps it should be asked, what else could George Herbert Walker Bush — and the CIA — be hiding?